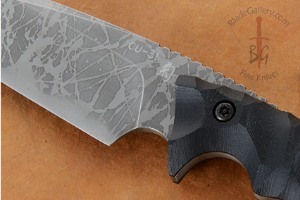 The OU-31 stain resistant tool steel blade will have exceptional edge holding. 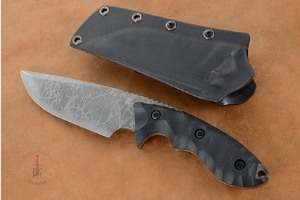 OU-31 is a Japanese PM (powdered metallurgical) steel with micro fine crystalline structure that embodies many of the best attributes needed for knives. The steel is hardened to 64 Hrc (very hard!) and has more than 3 times the toughness of D2. The blade features Kiku's high performance Hamaguri-ba (convex) grind along with his non-reflective disruptive acid finish. 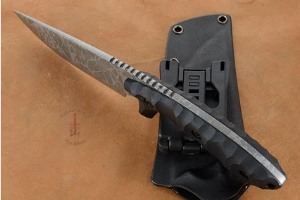 He designed this knife as the perfect hunting knife an it easily achieves his goal. The thumb area is fileworked for a sure, comfortable grip. 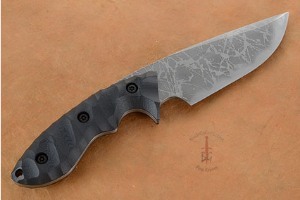 The black G10 handle is carved and set on the substantial full tang.